We’d love your help. 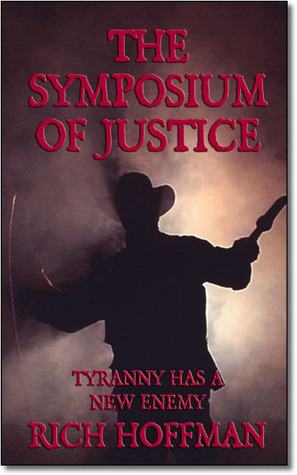 Let us know what’s wrong with this preview of The Symposium of Justice by Rich Hoffman. The freedom fighter, Cliffhanger battles the assassin, R.L. Justice and his Dark Knights of Order as sinister plots unfold upon the seemingly unimportant town of Fort Seven Mile. Inspired by Cliffhanger's writing and heroic actions council members, Mary Lawson, Misty Finnegan, and Gunsmith, Ben Carter plant the seeds of rebellion as powerful forces set their sights on the The freedom fighter, Cliffhanger battles the assassin, R.L. Justice and his Dark Knights of Order as sinister plots unfold upon the seemingly unimportant town of Fort Seven Mile. Inspired by Cliffhanger's writing and heroic actions council members, Mary Lawson, Misty Finnegan, and Gunsmith, Ben Carter plant the seeds of rebellion as powerful forces set their sights on the secret project, "The Veil of Knowledge," a form of mind control being conducted as an experiment soon to be unleashed upon the world. To ask other readers questions about The Symposium of Justice, please sign up.